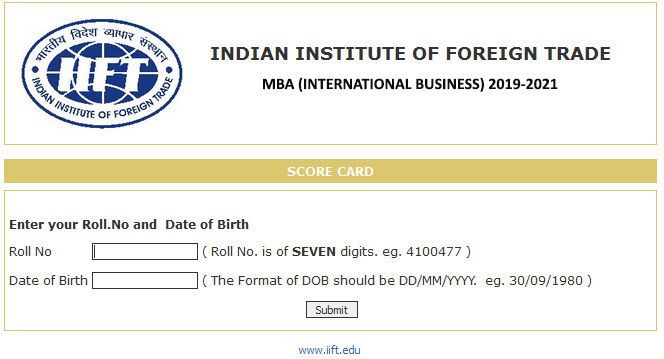 Please note that you should login with your IIFT roll number. The password is your date of birth as registered with IIFT in DD/MM/YYYY format. 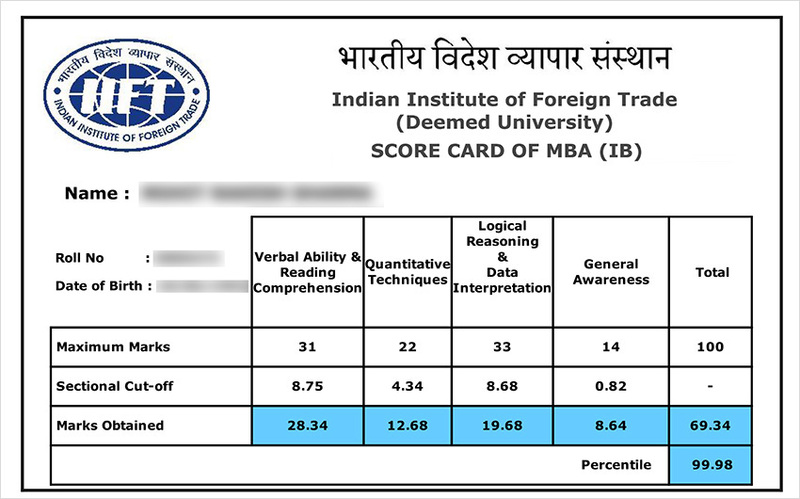 It will display your IIFT score card for MBA (IB) 2019 admission. The 2 years IIFT MBA (IB) 2019-21 course fee structure is Rs.16.70 lakhs. The fee is under revision and may be revised upwards a little, although no major changes are proposed. Even before the declaration of IIFT Result 2019, Indian Institute of Foreign Trade has concluded its final Placement 2019 in the month of December 2018 itself. IIFT has reported higher average salary, higher international packages, more PPOs and more recruiters. Average salary in IIFT Placement 2019 has gone up at Rs.20.07 lakhs. After getting shortlisted on the basis of IIFT score card, the shortlisted candidates have to go through the rigorous process of IIFT final admission round which consists of Written Ability Test, Group Discussion and Personal Interview. The GD-PI-WAT round for MBA (IB) programme at IIFT will take place from January 2019 onwards and final admission offers will be sent by IIFT by the end of March. IIFT entrance test for its most sought after MBA (IB) 2019-21 programme was held at 20 test centres across India in paper pen mode. The total number of questions that appeared in IIFT this year was 114 divided in six sections. IIFT doesn’t accept any other score than the score of its own entrance test for domestic candidates. 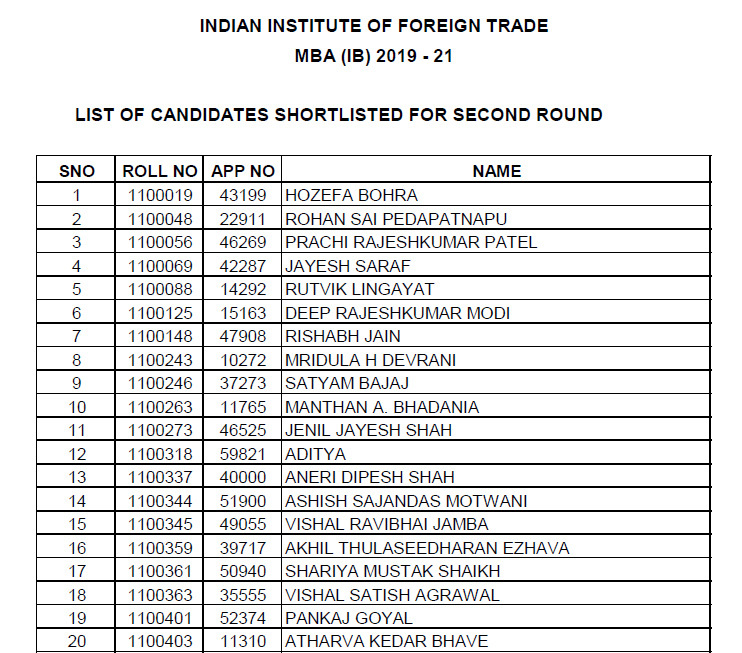 With an increased intake of 60 students for MBA (IB) 2019-21 at its Kakinada (Andhra Pradesh) campus, it is expected that more than 2100 candidates will be shortlisted for final admission round in IIFT Result 2019. There were about 60000 candidates had registered to appear in IIFT 2018 entrance exam. Out of them 55000+ candidates appeared in the IIFT entrance exam for admission to 420 seats in MBA (IB) 2019-21 batch in three campuses of Indian Institute of Foreign Trade on December 2, 2018 and are now waiting for the IIFT Result date. IIFT entrance exam result date which has a history of being published in the 3rd week of December, has changed since last year and the IIFT Result date has now been shifted to first week of January. The main reason for the delay in IIFT result 2019 declaration is the late conduct of IIFT entrance exam. Earlier IIFT entrance exam used to be scheduled in the last week of November every year, now it has been shifted to first week of December to avoid the clash of dates with IIM-CAT exam. IIFT offers a diverse portfolio of long term management programmes in International Business - 2 years full time MBA (International Business) at New Delhi, Kolkata, and Dar-es-Salaam campuses; 3 year MBA (International Business) (Part-Time), New Delhi and Kolkata campuses; Executive Masters in International Business, New Delhi; Certificate Programme in Export Management, New Delhi and full time 2 years MBA (IB) at its Kakinada campus with an intake of 60 students also.